Generally, in North America the farther north you go, the bigger the deer. In 1955, a 461 pound buck was shot in Maine. In 1926 and 1981, a pair of 511 pounders was taken in Minnesota. A white-tailed deer can sprint 40 miles per hour, jump 9 feet vertically and 29 feet horizontally. A buck's antler is among the fastest growing tissues on earth, growing as much as a . inch per day. 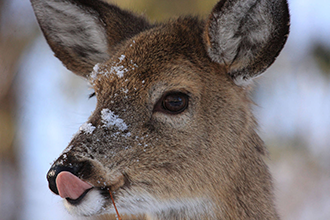 One out of every 2,500 antlered deer taken by hunters is a doe. The antlers are typically small and some never lose their velvet. These does are usually healthy and capable of breeding. The vast majority of bucks taken by hunters are between 1-. and 2-. years old; as few as 5% of hunted bucks are mature bucks of 4-. years or older. The oldest buck on record was a tame deer named Henry II who lived almost 21 years. In the wild, a buck can reach 12 years, but very few do because of disease or predators and especially because of hunters.